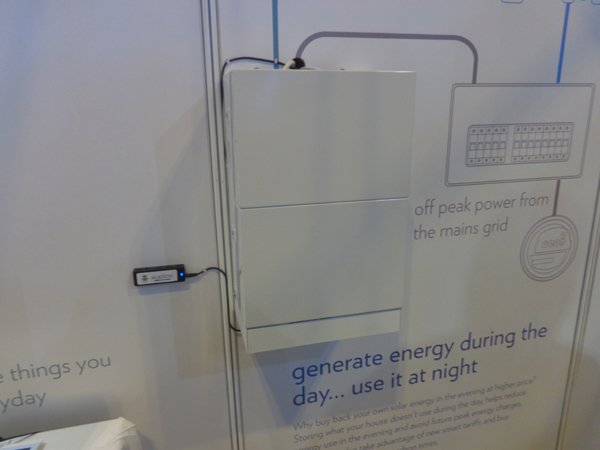 There were some interesting developments in domestic energy battery storage at Solar Energy UK 2015. Battery storage is still not an attractive financial investment in itself but changes from a year ago show that the cost trend is in the right direction and manufacturers are also thinking about other aspects of battery storage; space efficiency, providing emergency back-up, battery replacement and helping the grid to smooth demand. At the 2015 show there were products from two new companies: Maslow and Powervault. The Maslow is a 2kWh Lithium battery system for around £2,000 plus installation costs (prices are inc VAT). The Powervault is a 2kWh Lead acid battery system for a similar price. 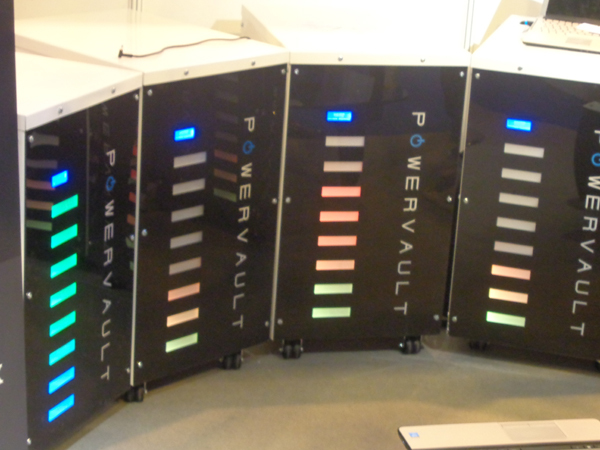 Powervault is a crowdfunded startup company. Both battery systems are straightforward to install. These new products can be compared with the Sunny Boy Smart Energy 2kWh Battery Storage And Inverter system (from SMA) which was launched at the 2014 show at around £5,500 (October 2015 price now around £4,600). So in a year the price of 2kWh of storage has tumbled from £5,500 to around £2,000. Even with the big fall in costs, there is no financial payback for consumers. If we assume a super generous 100% utilisation of 365 days x 2kWh usage per year at a very generous 15p per kWh of electricity saving we would be looking at maximum savings of £110 per year. With a battery life of around 5 years we would only have saved a maximum of £550 before having to replace the batteries. Not a great return on a £2,000 investment but better than the £5,500 we would have had to spend last year. With Tesla’s battery Gigafactory in Nevada coming on stream in 2017 we should start to see even lower costs in the coming years which could tip the balance towards battery storage offering financial benefits. Battery systems for domestic properties need to be designed with space constraints in mind. The Powervault is the size of a small fridge whilst the Maslow goes one better at 50cm x 30cm x 20cm (height x width x depth) and could easily be positioned next to a fuse board in many domestic properties. Designers of future generations of storage products will no doubt shrink the size further. Many people are surprised to learn that in the UK if the mains power is lost during daylight hours then solar panels do not provide the house with electricity unless you have an off-grid system (pretty rare in the UK). This is to prevent you exporting power into the grid as power workers are working on the network. An added benefit of the new battery systems is that they can provide 12 volt DC power even if you experience a power cut. So an LED emergency lighting circuit could be operated for some considerable time. There is also the option for a 240 volt socket which could be used to keep a deep freeze going for a while or a broadband wireless router for a lot longer. For those living in the country and subject to regular power cuts this is a big plus. It may also appeal to owners of canal boats and caravans who use solar as a main source of electricity at times. Both of the new products assume that consumers may well need to replace the batteries after 5 years without replacing the entire unit. Battery storage systems have appeal to energy companies as they can help smooth overall electricity demand, especially peak demand in the evening. This potentially means that the energy generators do not need so much short-term stand by capacity available to cope with peaks of demand. The Maslow system introduces this idea in the domestic market by offering consumers £75 per year for 5 years to take part in their GridShare scheme which “aggregates & dispatches power for grid services”, releasing energy from your battery system back onto the grid. Of course that will reduce the energy available for the consumer to use themselves so it reduces savings elsewhere but it could provide a useful additional form of income. To achieve this the Maslow system will require some form of networked software to communicate with the grid. We will follow these types of development with interest. The same sort of scheme could be applied to electric vehicle batteries as well. The planned reduction in Feed-In-Tariff (FIT) payments will put pressure on the industry to dramatically reduce costs. As well as the pressure on solar manufacturers prices there will be a focus on installers to reduce the cost of roof top installations. One area where new products may help this is on roof mount systems. We saw two new systems from Solar Slate Plate, a Redditch based business, which could help those installing systems on slate or tile roofs. Installing solar PV systems on slate roofs can be a big challenge in terms of time and materials. The Solar Slate Plate replaces an existing slate and removes the need for any slate cutting and weatherproofing using sealants. The designers claim that once an installer is up-to-speed a 4kWh system can be installed in 4 hours. This system will appeal to installers who want a rapid roof install with no risk of slate breakages and reduced return visits. 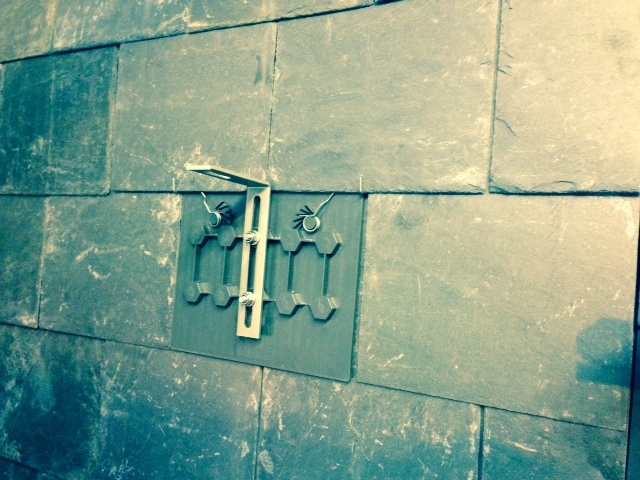 There are kit sizes to fit common slate sizes and the cost is under £20 per hook. This system works with standard clay tiles (265mm x 165mm). It requires the removal of four tiles, three of which are re-used and the fourth tile substituted by the Eric tile system which is fixed to the rafter. 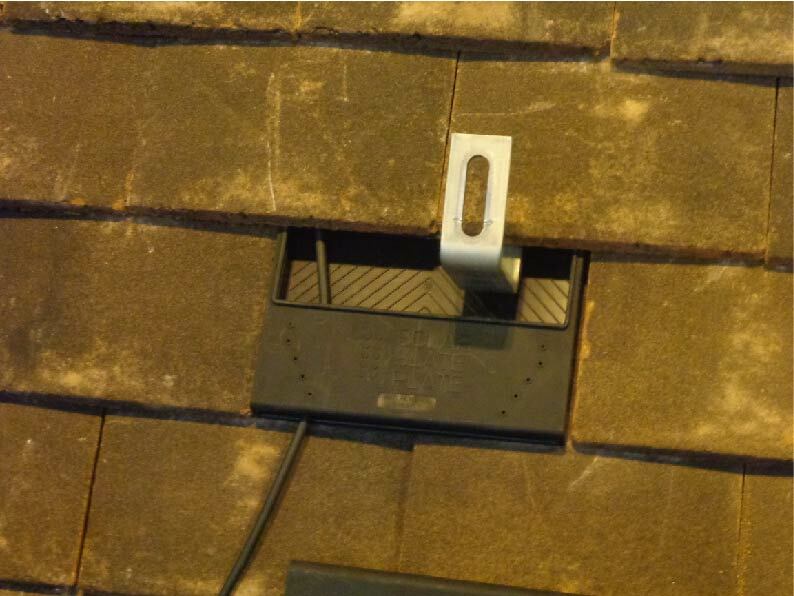 The system removes the need for cutting any tiles and there is no need to use flashing or sealants; connecting cables can be run from the roof without concerns over weatherproofing. These features cut down on installation time and the designers claim that one hook can be installed in under a minute and a complete roof system in 3 hours. The cost is around £8.50 per hook. Installers I spoke to felt the planned FIT changes would mean there was no investment return on domestic solar PV panels (systems under 4kWP) so the decision of a consumer to go solar would be based mainly on their view on “protecting the planet”. 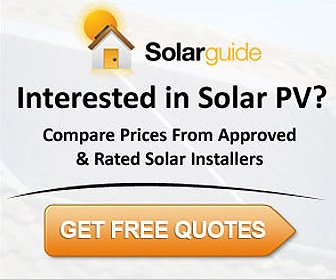 Installers expect a big decline in the solar installation industry in 2016 with a reduction in domestic installations of somewhere between 75% and 90% in the first half of 2016. One installer was planning to install 4 systems a month in 2016 rather than the 40 systems a month installed in 2015 and three of his four installation teams would be made redundant. Working on these sorts of declines would reduce domestic installations from around 10,000 solar PV systems per month to between 1,000-2,500 per month. It should be mentioned that the result of the DECC industry consultation is yet to be published but most in the industry fear the worst and are already laying off staff and closing offices so even if there is a rethink by Amber Rudd, the government minister responsible for this dramatic change, it will still hit the industry hard in 2016. DECC have argued that solar manufacturer prices are artificially high and the withdrawal of the FIT subsidy will encourage a drop in system installation costs. That may be true in the medium term but most installers said there were no current indications of suppliers planning price cuts. Given the rush in installations to beat the January cut off, prices were if anything rising. This is likely to mean a very low level of installations in the January-April 2016 period as even if prices fell in early January it would take time for these prices to filter through to consumer quotes and on to installation activity. EU anti-dumping measures on solar panels, implemented in January 2014 after a complaint by a German manufacturer, are also due for review in January 2016 but there is no indication from the EU whether the measures will change. It was felt that very small businesses with 1-3 employees that only did solar pv installations as a minority part of their mix of work could survive, by focussing back on their other work such as roofing or electrical. Larger companies, particularly those with office overheads and office based staff, could well have to close the solar PV element of their business to survive. We await the final result of the consultation in the coming few weeks.